Our CPU is suitable for all types of ophthalmological trials requiring standardised ophthalmological investigations. The surveillance system allows first-in-human trials with new drugs intended for ocular administration. But subsequent pharmacokinetic trials, trials for assessing systemic exposure after local ocular administration and pharmacodynamic testing up to phases II, III and IV in patients are also possible. Ocular tolerability assessments are standard investigations and run routinely – tailor-made clinical trials are our day-to-day business. All ocular standard investigations are done at our CPU. If special tests are needed, subjects are transferred to a highly specialised ocular centre nearby. Further measurements like refractometry, tonometry, perimetry and biometry complete the eye examination tools. Surgical facilities are also connected. A team of highly experienced ophthalmologists, optometricians, phase-I investigators and study nurses ensures highly professional study conduct in compliance with all EU and US approval requirements. In the case that healthy subjects are needed, our own database allows highly effective recruitment. 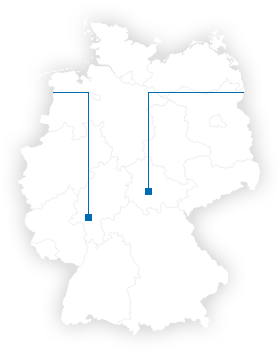 For patient trials, our network of ophthalmologists all over Thuringia results in excellent recruitment rates among patients.